This weekend we were at the HINTS Conference in Charlotte and I happened to have the most interesting conversation with Caryn Hommel of Excelerate Language. I thought I’d come back over and interview her so you guys could hear from her, too. Hi Caryn, tell me again why you believe the way most language programs work isn’t really effective. I took three years of French in high school and don’t remember more than “Bonjour!” Basically, there are four components to traditional textbooks in any foreign language: Structure and Vocabulary, Lame Dialogues, Drill (Which many call kill and drill because they kill you with drill) and Cultural Notes. Then the books are dressed up with beautiful pictures and lots of busy to make it pretty. The order might vary but all those components stay the same no matter whether it is a Christian company or a public school textbook publisher. The reason why this doesn’t work is because there is a natural order of acquisition of language and that methodology doesn’t honor basic principles of brain functioning. They are learning about Spanish, but they are not learning Spanish. So, tell me what does work? What’s natural? The way we acquired language as children is natural. We are designed to acquire language. We used all of our five senses in the process, from birth. We were designed to learn language because God wants to communicate with us. From the beginning, we are surrounded by language and experience it with all our senses. We aren’t expected to produce language in the beginning, but we begin to develop a mental graph and understand the language. We begin to respond non-verbally, then our ability builds into short answers and in sentences, paragraphs and finally won’t shut up! This all occurs without any formal grammar teaching, no flashcards, no formal instruction. Instructors can help us in the same way our parents do – by using caretaker language: simple words, lots of repetition, slower speech. So, how did you develop your program? When I began homeschooling my children I picked a traditional Spanish curriculum well-known in the homeschool community and invited some friends to have their middle school age children join my children to learn together. After three weeks, I gave the children an assessment and despite my best efforts, our good student-teacher ratio – and their hard work and attention, their results were very low. I was dismayed and they were frustrated. I began looking into alternative methods, beginning with TPR: Total Physical Response. TPR has been around since the 1980s and was the brainchild of Dr. James Asher, a prominent brain researcher. 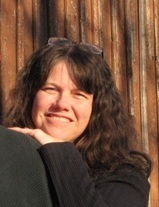 Dr. Asher discovered that children with no previous exposure to Japanese were able to respond appropriately to complex and varied commands in Japanese after only a very few hours of instruction when taught by a fluent Japanese instructor who modeled his utterances with gestures and physical movement, which the children then imitated as opposed to reproducing the verbal utterances themselves. They were not expected to repeat what he said. So, I decided to this, pulling together private classes of homeschool students for TPR-based lessons weekly for an entire school year. Their attitudes, their ability to respond appropriately, their comprehension level were all so superior to anything I have seen before that we were all overcome with joy! We were smiling, we were laughing. They felt successful, confident and happy. This was radically different from our previous results. The next fall many of those same students returned for more classes, but I sensed that they were impatient to do more, that they were rearing to go in learning the language. They needed something more than what we’d been doing. I would have lost them if I’d kept doing the same thing, so I pulled one of Blaine Ray’s books off my shelf, one I’d never used, and gave his ideas a try. We used TPR for the vocabulary, then we acted out a completely crazy story. When the students use their bodies, it causes their motor cordices to light up. When they do stories that engage their emotions, that uses the limbic system in the brain. So, we use Total Physical Response Storytelling, also known as Teaching Proficiency Through Reading and Storytelling. It’s a very natural, fun way to learn and it is very successful in building mastery and retention. What age do you recommend your materials for? I’ve taught classes using this material from ages six to adult. My younger children don’t do the workbook. Every child will pick it up according to their age and ability level. The main thing with younger children is to stop instruction before they get tired. Stop it and wait for later while they are still excited. On the other hand, with older children, I would feel very comfortable giving Spanish I credit. We haven’t tried it yet, but this looks like a great way to teach boys – very active! 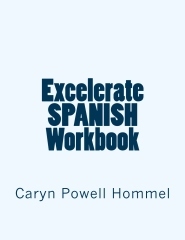 We’ll be reviewing Excelerate Spanish in the next few months here, but in the meantime, Caryn has graciously offered to let us do a giveaway!! 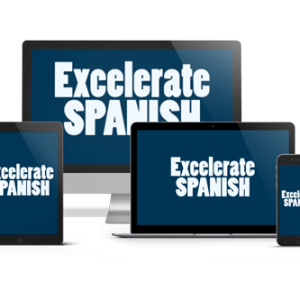 That’s right, one winner will win the ENTIRE EXCELERATE SPANISH CURRICULUM, DVDs and all! It’s a $149 value! 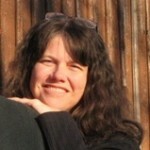 This interview originally appeared on Raising Real Men, republished with permission.